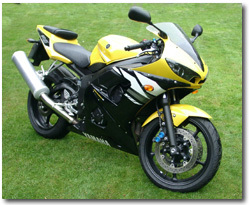 It seems hard to believe that the R6 has already been on the market for five years. Its arrival back in 1998 was slightly overshadowed by the simultaneous launch of the ultra exotic (and appropriately expensive) R7 race replica. But despite the in house competition, the little 600 proved to be the bike that everybody really wanted to know about after the celebrity fuss had died down over its bigger brother. Even then there were certain things that attracted attention – a claimed 200bhp/litre not being the least of them. 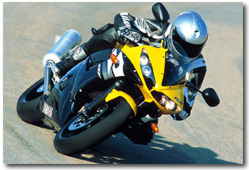 The R6 has always been a big hitter for its size while managing to remain a featherweight at the same time. Muscle, it seems, does not always equal bulk. This, the latest incarnation, continues that trend with a claimed 123bhp allied to a dry weight of just 162kg. That’s a neat trick, because at a glance the R6 is actually quite a large motorbike. The fairing with its row of headlights reminds me of a grinning frog, and makes an interesting comparison to the alternative approaches to aerodynamics taken by other manufacturers who are making their bikes noses pointier and higher. The tank is a good size and the seat is enormous. 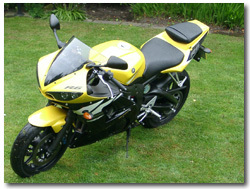 Looks are a definite strong point with the 2003 R6. Quite simply, it looks stunning, especially in the limited edition yellow and black we had on test. It is one of these bikes where there doesn’t seem to be a single angle that jars – it just looks right. The only thing I was less than totally blown away by is the huge and, I feel, rather unattractive silencer. Sure it’s necessary for all the current legislation but there must be a way of making it look less out of place. Then again, most owners will probably just file it away in a box somewhere safe while they fit aftermarket cans anyway. The four headlights, the black wheels and frame all look great. The LED tail lights are beautifully integrated. Everything just works. As you may be able to gather, I was impressed. But more importantly, so was pretty well everyone else. Even that most damning of critics – my 12 year old daughter – gave her unqualified approval. So no complaints there. But of course, even the best looking bike in the world would be no good if the riding experience were horrible. You probably won’t be surprised to hear that it isn’t. Not even a little bit. Sitting on the R6 gives the game away. It may look big but it isn’t. It’s not cramped as such, but it sure is small and delicate feeling. As is generally the case these days, everything falls pretty well to hand with no surprises, the mirrors show that there may be something behind you (although they blur sufficiently that you’ll not be able to tell what it is until the blue lights come on), the de rigueur digital display tells you most of what you want to know and the tacho redlines just under 16,000rpm. There’s a gearshift light, and for the first time I think it may almost be something more than a gimmick. But more on that later. Pulling away is a forceful reminder that this is still only a 600. If you want to make anything more than pedestrian progress you need to use a few revs and dance on the very slick gearbox a bit. It’s not a problem, simply something that comes naturally after a few minutes. Here’s something you’ll not hear often. I tended to short-shift at around 13,000rpm out of town if I was pressing on a bit. That’s right – on this little chap changing up at over 500 bangs a second counts as short shifting. Holding on to the red line didn’t seem to achieve anything other than make the shift light come on and the engine sound rather nasty. Again, a fruitier end can would probably resolve that while adjusting the shift light to 13,000 would mean that you changed at leak power and dropped back near to peak torque. A happy situation to be in. Once spinning, the engine is a peach, with a crisp and smooth reaction to the throttle, very little vibration and an eagerness to rev that has to be seen to be believed. It’s also quite economical, although again that will be of little interest to the target audience unless they’re trying to make it to the next garage in the middle of nowhere on a Sunday rideout. Handling is wonderful, with an incredibly sharp turn in. Stability was pretty good although the light weight and fairly radical geometry conspired to make things get a little unruly when the road got bumpier. Certainly there were places on my normal test route where I would have liked things to be a little plusher, but at the same time there were other places where the billiard-table smooth tarmac allowed the suspension to work brilliantly. As a track day bike I can think of very little better. Although we didn’t have the chance to prove that for sure, the impeccable smooth road handling, brakes and engine would, I believe, be a tough combination to beat. Talking of brakes, Yamaha must produce the most consistently excellent brake setups of any manufacturer. I’ll admit that almost all their bikes have, or appear to have, brakes lifted directly from the R1, but as they were by far the best bikes to appear on a production machine at the time then that can hardly be considered a bad thing. The braking arrangements on the R6 are right at the top of the tree – immense power with superb feel and, unusually, a rear brake that actually does something other than satisfy a legal requirement as well. Rider comfort isn’t usually very high on the priority list with a bike like this, but the R6 scores pretty well on that front as well. A benefit of the larger fairing is that there is at least some degree of protection afforded by it, and the large and well designed seat makes a surprisingly pleasant place to rest once any exciting corner action has been despatched. The engine is pretty smooth and doesn’t transmit too many vibrations through the bars or pegs. They’re all, it seems, absorbed by the mirrors. In fact the only criticism I’d have of the ergonomics is the surprising omission of a clock from the LCD panel. I know that we ride to get away from realities like time, but there are occasions when you need to know that, for example, you’re late for the ferry so actually need to get a move on. It’s not as if Yamaha would have to bolt something extra on, after all. There’s space on the panel for a clock, and it seems a little silly not to have one. So there you are. The only thing I can find to complain about is the absence of a clock. 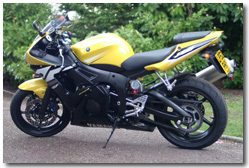 I can easily see why so many people put this as their number one sportsbike. Because yes, it really is that good. Liquid cooled 600cc four cylinder 16 valve four-stroke. 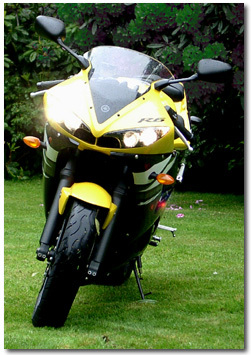 Read external Yamaha YZF-R6 reviews on ciao.